Our first full day of ministry started at 6:00 am this morning when we met in the hotel lobby for our devotions togther as a team. Thirty minutes later Dr. Fleenor came by and we were off to his medical clinic to pick up some of the girls in nursing training. Then we picked up a few more from the Rapha House before we headed out of town. 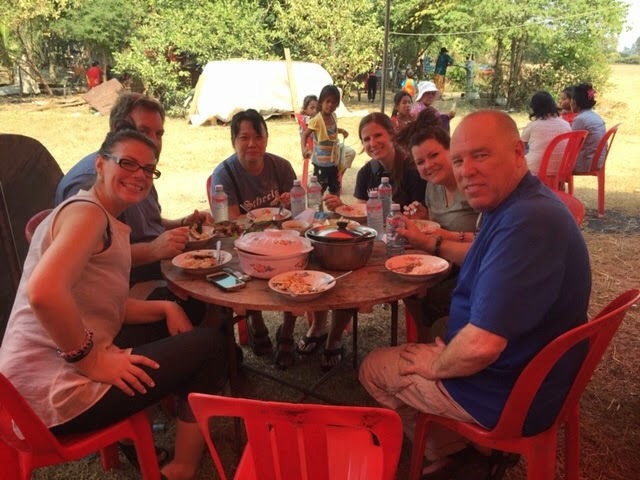 It was fun for the 21 of us to stop at a Khmer restaurant for breakfast on our way to the village. Our two choices for breakfast were fried pork with rice or soup. Most of us had the noodle soup (Yum!). We spent the day working in a medical clinic outreach in a small village a little more than an hour outside of Battambang. Doctors and nurse practitioners saw patients, dentists checked and pulled teeth, there was a table fitting people for eyeglasses, and a pharmacy. Pastor Cameron spent time one on one praying for patients as they waited to be seen by a nurse or doctor. Cameron shared some neat stories of answered prayer (but you will have to hear those directly from him). Here you see us on our lunch break eating rice and fish (it still had its head attached!). One of the highlights of the afternoon was eating part of a cooked rat. It was surprisingly tasty. Just ask one of the other team members. Tomorrow we have another early morning scheduled in anticipation of a full day medical clinic in another village. We sure appreciate your prayers! Please pray especially for Margie as her back is really hurting.